We're still floating on cloud-wine after three amazing days as the official wines of The Ohana Fest! With headliners like Eddie Vedder, Mumford and Sons, and Eric Church, along with other amazing acts like Switchfoot, Norah Jones, the Yeah Yeah Yeahs, Beck, and Young the Giant... we were loving our time in the SoCal sun at Doheny State Beach! Butter Chardonnay just got even easier-to-love—How? Well, we’ve put it in cans! 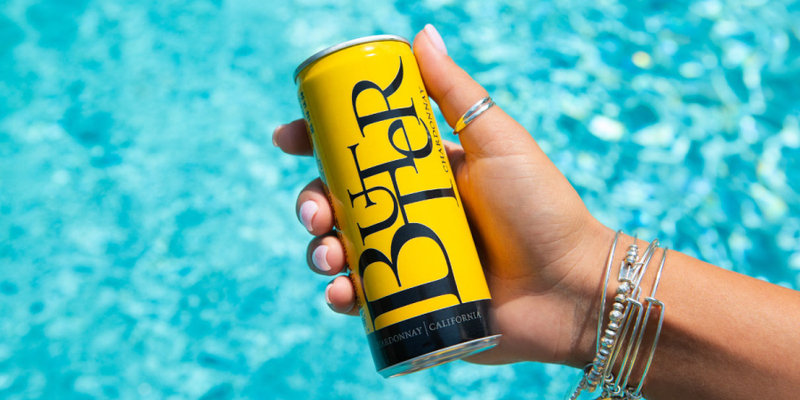 Our lovable little cans are as ready as you are for your next adventure, pool party, or simply patio-sipping (that makes us just as outdoorsy, right?). ButterCans are coming to grocery stores near you all over the country, check out which ones here. You can also find them online here. 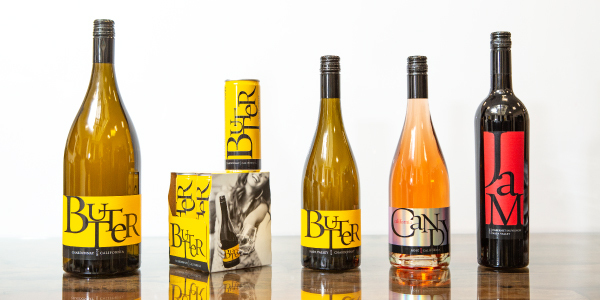 Check out other ButterLovers on the go by following us @JaMCellars using #ButterCans! Splash at the Beach - A splash of Butter in the sun makes our day perfect, and being by the water always makes it better. Whether it’s the river park or the ocean, our antidote to Fall is a beach picnic—no dirty dishes, yummy finger foods, inner tubes and floaties filled with Butter. Nothing says summer like a yellow picnic blanket and a lazy day with your crew. Did someone say ButterCans?? Summer is totally a state of mind and it’s not over until you say so…or the Butter runs out—gasp! Follow our endless summer #SummerBucketList fun on Facebook and Instagram. “Come away with me” to the Ohana Music Festival 2018! We are packing our bags, Butter sunglasses, and cutest beachwear and boarding the ButterBus to Dana Point, southern CA for this year’s festival. JaM Cellars is the official wine sponsor for the second year running. 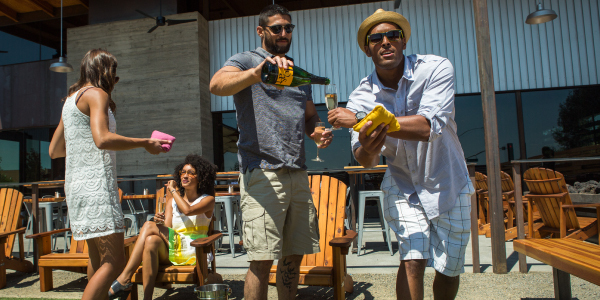 We’ve got you covered with Butter, JaM Cab and Candy Dry Rosé to keep you groovin’ in the sand all weekend long. 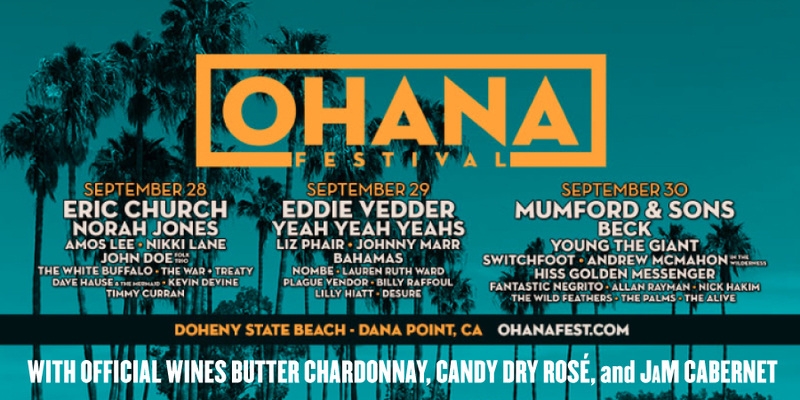 “There’s a big, a big hard sun” waiting for us at #OHANAFest as we swoon to Eddie Vedder on Saturday (but seriously, don’t forget your sunscreen!). We’ll kick off our dancing shoes to “Keep the earth below my feet” with Mumford & Sons on Sunday. And we’ll be mixing in a sprinkle of Yeah Yeah Yeah’s, Amos Lee, Young The Giant and more for a fantastic music weekend and govinos filled with our fave JaM wines in hand. Want to put your toes in the sand and Butter, JaM and Candy in your govino at OHANA? JaM has got you—we are giving away two pairs of 3-day General Admission passes to two lucky winners! Enter to win here and follow us @JaMCellars on Instagram! It’s always nice to get noticed, and our rich dark and handsome JaM Cab has been getting some mighty fine compliments from the editor of Wine Enthusiast, Jim Gordon. Jim gave JaM a soaring 90 Point rating and called us “lip-smacking”. Thank you, Jim! And not that you need an extra reason to stock up on JaM Cab but August 30th is Cabernet Day! 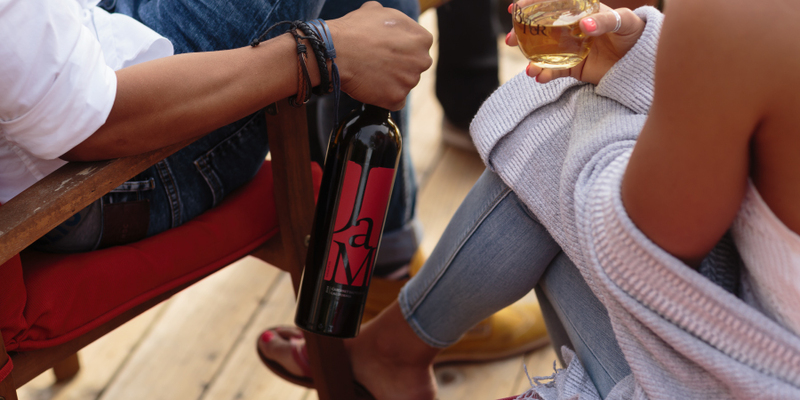 So grab a bottle (or two) of 90 Point JaM Cab and raise a glass to Cabernet—the king of Californian wine, to John and Michele the “J” and “M” in JaM, and of course to Jim. Cheers! We can almost smell Fall right around the corner, so now is the time to squeeze all the very last bits of summer we can! It’s not over until the Butter runs out! Or, at least until it’s officially Fall on September 22nd. 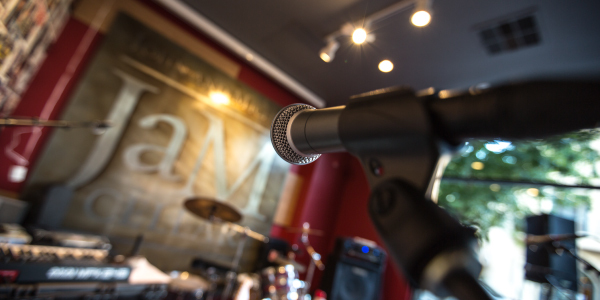 So keep the party going with us all September long on Thursdays and Fridays with live music at the JaM Cellars wine & music studio. This month, we’ll be rocking out to our favorite touring artists including local Bay Area band the Travis Hayes Band, Sunny and the Black Pack, and The Mosiacs kicking off at 9pm each Friday in September. We never charge a cover fee, so it’s the perfect excuse for a night out on downtown Napa! Here’s the good news; you don’t have to hang on until the weekend to hang out with us because on Thursdays we start the party early with live music kicking off at 8PM. Ready to make this an all evening affair? At 4PM we offer a complimentary “toast with Toast” that sets the mood for a good time, every time. Ready to get your groupie fanfare ready? 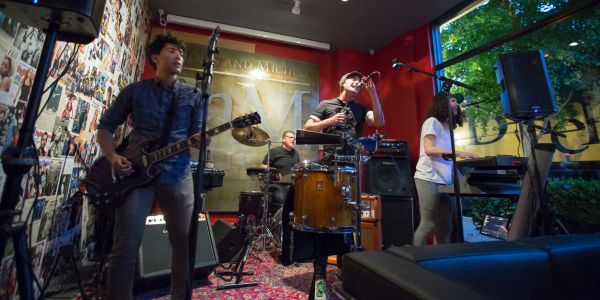 Check out our events calendar to see who’s playing each night and rally for the last bit of summer in September at the JaM Cellars! It’s summer time and we love adventure! Whether you are hitting the road for a last minute roadtrip or operating from home base for a staycation, there is fun to be had all summer long. Camp the national forests OR camp in your backyard. If you’ve got the travel bug (and the bug-spray! ), explore one of the amazing campsites in our country’s best national parks! Don’t feel like lugging your wine stash around? We’ll take a little backyard camping any day. 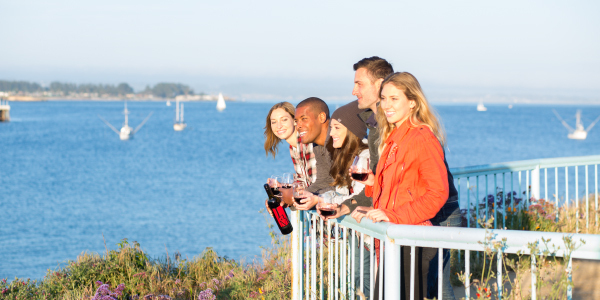 Sit back, relax, and sip from a bottle of JaM Cabernet as the s’mores are roasting. Keep your glass from tipping over during that extreme game of Giant Yard Jenga with a backyard wine caddy, because you are a professional, after all. Take a road trip to one of the USA’s Top 10 Waterparks for a splashing good time. Or, stay out of the splash zone at your backyard pool with this giant rubber duckie...cup holder is a must so you can stay sippin’ on California Candy Rosé all afternoon long. Whether you are country or hip-hop, summer is the time to rock out to the best tunes live. Can’t make it to a live show? We’re keeping you grooving if you hit up our favorite summer playlists. From classics to currents, you don’t need to dance...you make Candy move! Ok...maybe you’ll want to dance a little. Get your culture on at one of this summer’s best art shows. Summer sophistication is on the bucket list right? If you can’t make it out, bring out your inner artiste instead. Break out the paintbrushes, turn up the tunes and let a couple glasses of JaM Cabernet lead the way to creative genius. 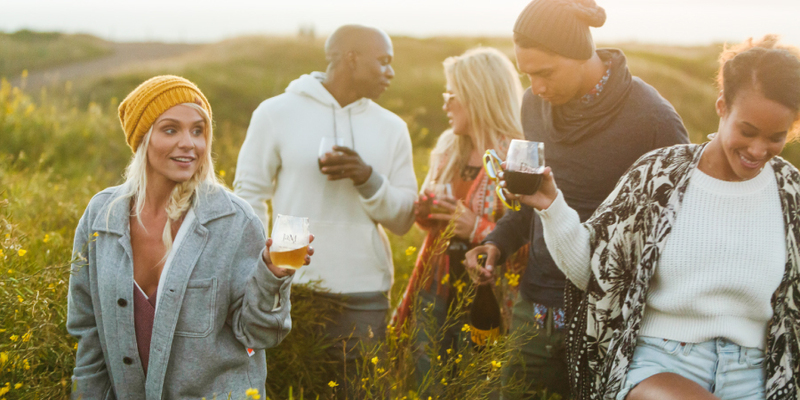 Whether you’re headed near or far, enjoy the best of summer festivities with a smooth, chilled, creami-licious GoVino filled with Butter Chardonnay always on hand. We’re feeling those Summer vibes and thinking 2018 is the perfect year for a throwback. This summer, throw it back to the classics with a Toast to The Classics summer agenda. Find a local Drive-In and pack up the blankets and snacks for an old-school theatre experience. Can’t find one? Create your own film festival with a rented projector screen in the backyard. Breakfast Club, Princess Bride and Ferris Bueller’s Day Off are all on deck for a throwback party. Popcorn and Butter have never been a more perfect match. Doesn’t everything just sound better on vinyl? We’re thinking yes. Splurge on an authentic turntable record player and hit up the vintage shops to discover some new oldies but goodies. If you can’t get your hands on the classics, rock out to our summer playlists on this bluetooth stereo turntable. A velvety glass of JaM Cab is extra smooth with those vinyl airwaves. Yellow is the official classic color of summer. We’re walkin’ on sunshine in yellow polka dot bikinis, yellow sunglasses, and of course a bottle of Butter top off the look of the season. Pack up your trunk with some blankets, pillows, and a bottle of Toast for a night of summer stargazing. It’s ok to cheat a little and break out your stargazing app to see where exactly that North Star is. Trade screen time for quality time with old school board games like Clue, Operation, and Scrabble...anyone else get a more creative vocabulary after a glass or JaM Cab...or two? We know you have a deck of cards lying around here somewhere. Master these three classic card games for the most retro fun you’ve had all year.